Anyone collecting old postcard photographs will come across the name Jerome Ltd. on the back of a print sooner rather than later. They operated walk-in photographic studios on high streets across the UK in the 1930s, along with print and develop services for customers, and a head office in Holloway in London. The firm was pre-dated by Gale Studios, begun at least as early as 1911, growing to around 18 branches by 1920, mainly in the North of Great Britain. Jerome were slightly later rivals, and the two firms eventually decided to merge and really grow the business using the Jerome brand. The merger had been completed by 1930 and over the next decade, the firm’s boast of “branches everywhere” became a reality. Customers could walk into a Jerome studio off the street, have a portrait session and leave with a modestly priced finished print (or call back later.) The firm continued to grow into the 1950s and some Jerome branded studios were still going in 1969 but they were wound up the following year. But one aspect of Jerome’s business remains unanswered; did they take walkies? 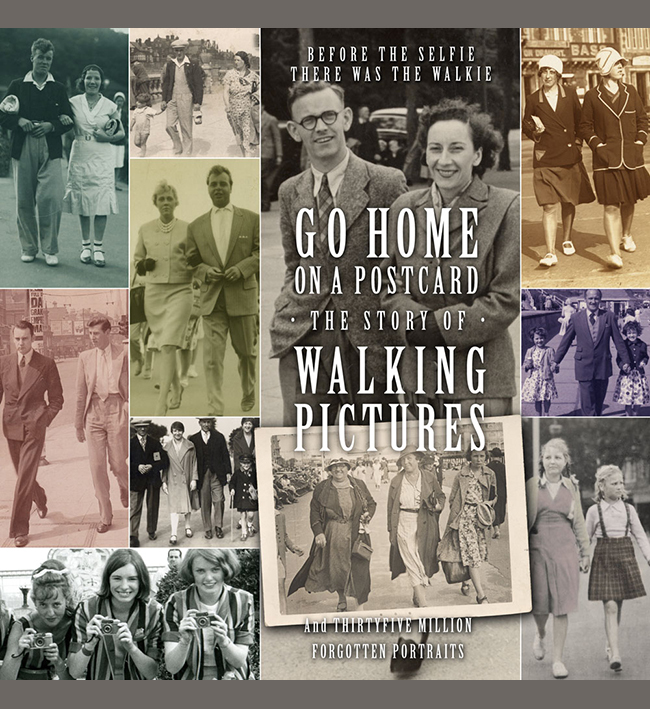 I have found what certainly look like proper Jerome walking pictures, so perhaps they cashed in on this sort of souvenir photo for a time. An example is featured here. Given that immediacy was paramount with souvenir photos, perhaps Jerome opened temporary facilities at some seaside towns during the busy holiday season (as other firms are known to have done) although I’m not sure how this would have worked. If anyone has any knowledge of this operation I would be interested to hear from you. The print is shown here in the very decorative deco style Jerome photo wallet. Both it and the walkie look to be from the 1930s, but unlike most Jerome studio prints this one is not dated, and I have not been able to identify the seaside location. There are some studio portraits by Jerome on the site.